Printable 1:12 dollhouse scale and some 1:6 or playscale boxes can be scaled larger or smaller with your printer. Each page has two small and two medium boxes, two shirt boxes and a round hat box. Preparation Print the designs on printer paper or light card. After printing, coat the designs with acrylic varnish or sealant if you wish. When the varnish is dry, cut the designs out along the outside lines and fold them to shape using a straight edge or bone folder. Fold or score the boxes along the straight edges between colors. Fold or score across the base of the box by running a fold that continues the outer line of each box side, (making a rectangle or square for the box base.) Score the boxes so the tabs will fold in. Lay out the box so it is the shape of a cross, the longest end pointed towards you. Glue the sides starting with the end square on the side arms of the cross beside the tabs. Fold and glue it to the inside of the tabbed section. Join the sides Fold the outside square at the top of the cross to the inside as you did with the sections near the tabs, but do not glue it yet. Fold the two tabbed sections and the top section at right angles to the box base. Glue the tabs on the colored edge and set them inside the top side. Glue the wrong side of the upper top square and fold it down over the tabs, gluing them in place to the box side. Glue the final side and liner by repeating the last step with the last box side. The larger colored tab section will line both the side and bottom of the box. Fold the side tabs down at right angles to the box top. Fit the box lid over the box. Cut a strip of banding and fit it around the box top over the tabs, bending it crisply at the corners. Trim the band and glue it to the tabs while the lid is on the box, making sure the lid is not too tight. Remove the box lid until it is dry. This set of shop boxes is in the color scheme of black and white. You can print them from this Black and White Shop Box PDF (acrobat reader) file on colored paper or card to create a unique color set. Each sheet contains two small and two medium square boxes, two shirt boxes and a round hatbox. A co-ordinating set of Black and White Shop Bags is also available. Cut out the two circular sections and the wide strip at the bottom of the page. Also cut out the decorated band above the wide strip. Curl the wide strip around a pen or pencil. Turn the tabs at the bottom of the wide strip so that the face away from the strip. Overlap the ends of the strip to form a circle. Lay the plain circle over the tabs to check that the circumference of the circle made by the side strip is the right size for the base. Glue the side piece into a circle and set it aside to dry. Apply glue to the tabs at the base of the box side and glue them to the plain circular base of the hatbox. Set aside to dry. Fold the tabs on the striped lid of the hatbox down. 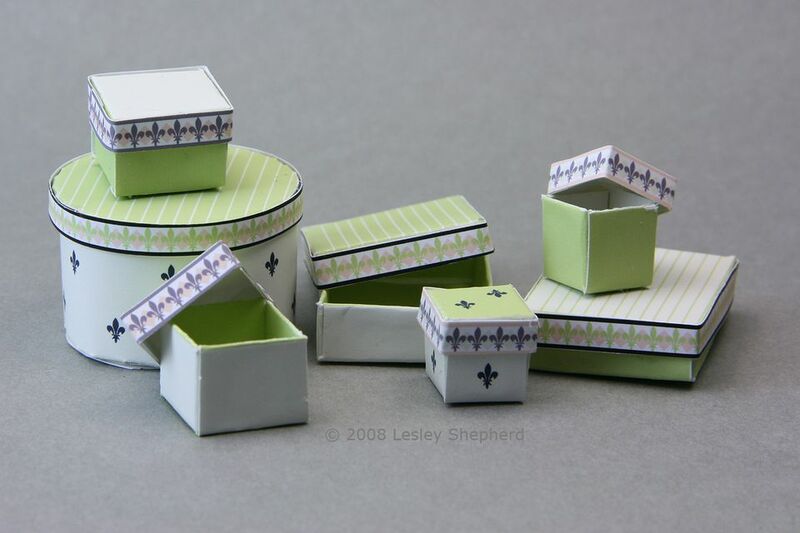 Fit the patterned band around the tabs and glue in place when it is the correct size for the side of the hat box lid. Leave to dry. This set of shop boxes is in a silver color scheme. You can print them from this Silver Boxes PDF (Acrobat Reader) file. Each sheet contains two small and two medium square boxes, two shirt boxes and a round hatbox. A co-ordinating set of Silver Shop Bags is also available. Apply glue to the tabs at the base of the box side and glue them to the plain circular base of the hatbox.Set aside to dry. This set of shop boxes is in a gold and cream color scheme. You can print them from this Cream and Gold Boxes PDF (Acrobat Reader) file. Each sheet contains two small and two medium square boxes, two shirt boxes and a round hatbox. A co-ordinating set of Cream and Gold Shop Bags is also available. This set of shop boxes is in a Victorian crimson and emerald color scheme. You can print them from this Victorian Boxes PDF (Acrobat Reader) file. Each sheet contains two small and two medium square boxes, two shirt boxes and a round hatbox. A co-ordinating set of Victorian Shop Bags is also available. This set of shop boxes is in an Edwardian color scheme of Eau de Nil, Foyer Green and Salmon Creme. You can print them from this Edwardian Green Boxes PDF (Acrobat Reader) file. Each sheet contains two small and two medium square boxes, two shirt boxes and a round hatbox. A co-ordinating set of Edwardian Green Shop Bags is also available. This set of shop boxes is in a Robin's Egg Blue and Lavender color scheme. You can print the 1:12 scale boxes from this Robin's Egg Blue Boxes PDF (Acrobat Reader) file. Each sheet contains two small and two medium square boxes, two shirt boxes and a round hatbox. A co-ordinating set of Robin's Egg Blue Shop Bags is also available. This set of shop boxes is in a Sherbet Pink and Yellow color scheme. You can print them from this Sherbet Pink and Yellow Boxes PDF (Acrobat Reader) file. Each sheet contains two small and two medium square boxes, two shirt boxes and a round hatbox. A co-ordinating set of Sherbet Pink and Yellow Shop Bags is also available.